While the Dominican Republic (nicknamed the DR) is one of the most popular winter destinations, especially for Canadians, the majority of sun seekers opt for an “el cheapo” week at an all-inclusive where the emphasis is more on quantity than quality. 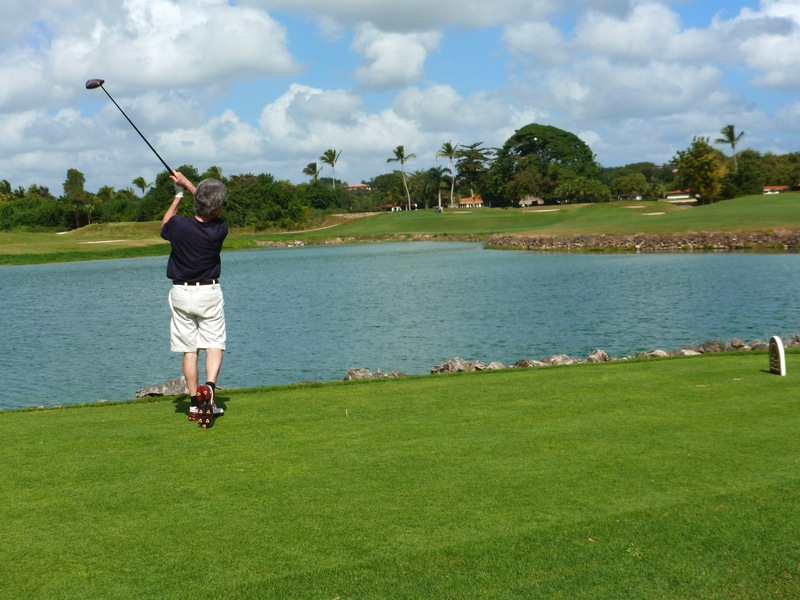 However, if chasing a dimpled white ball in style and without the masses, is a prerequisite to your vacation, Casa de Campo delivers stellar golf, plus the kind of five-star service and amenities you’d expect from a member of The Leading Hotels of the World. At the 2011 World Travel Awards, Casa de Campo walked off with five accolades, including the “Caribbean’s Leading Golf Resort” and “Caribbean’s Leading Resort.” Trust me, (this is my third visit) Casa de Campo ranks several notches above your basic cookie cutter rum-soaked all-inclusive. 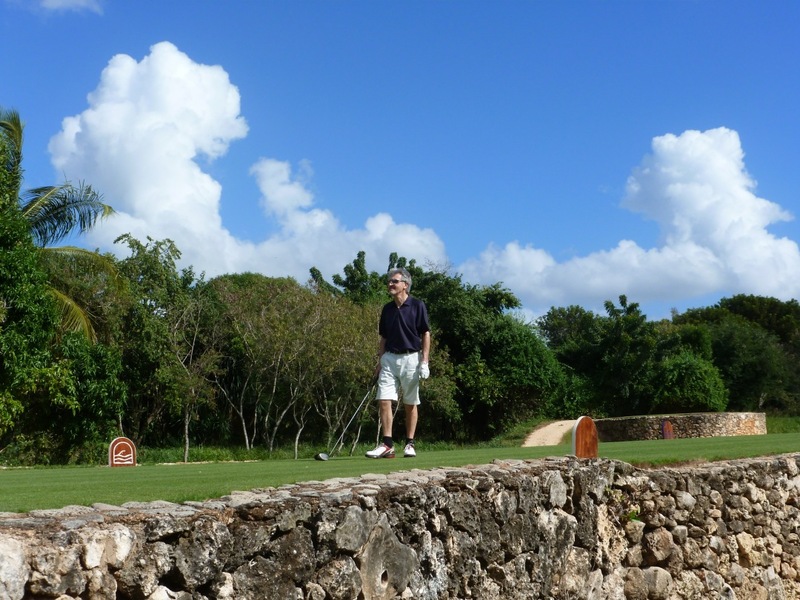 Golf Road Warrior writer and photographer, David Whyte and I arrived at Casa de Campo earlier than the rest of the gang giving us a chance to warm up on Pete Dye’s Links Course this morning. The Links, an undulating interior course reminiscent of the traditional British and Scottish layouts, features small greens surrounded by very efficient bunkers and lots of lagoons on its back nine. The greens were recently remodeled and planted with Paspalum grass. If your game is a bit rusty, this is where to work out the kinks. After our round, David and I sliced a bit more at a cooking demonstration with chef Luca Banfi—a delicious diversion for both foodies and non-golfers. 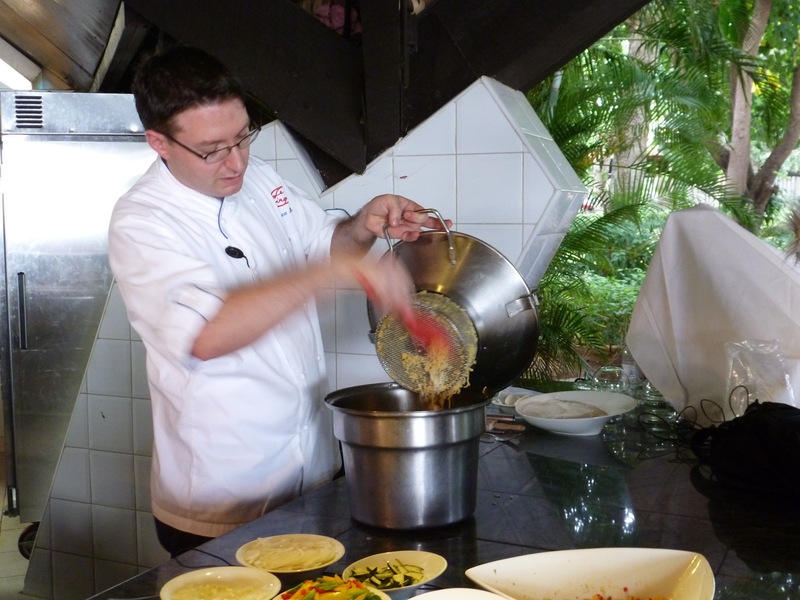 Originally from Milan, Banfi has cooked his way around the world. Now he presides as head honcho at Casa de Campo’s Beach Club restaurant, operated by Le Cirque, Manhattan’s iconic restaurant and the place to be seen. Banfi’s “fusion” cuisine combines classic Italian flavours and variations on some of Le Cirque’s signature dishes with a fresh Caribbean twist. 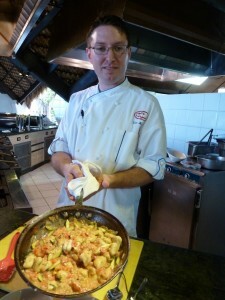 Today he whipped up a trio of mouth-watering dishes: mango salsa with plantain and root veggie chips; gnocchi made with green plantains and a fresh basil/tomato sauce; pan-seared veal medallions served over a pepper stew and topped with Taleggio cheese. Banfi’s dishes burst with robust flavours yet they are easy and quick to prepare. (Recipes are coming). Casa de Campo recently invested $12 million in its central kitchen, installing state-of-the-art facilities to ensure that all meat, eggs, poultry and produce are handled and stored according to the strictest hygienic standards. They also have their own herb garden. All in all Casa de Campo offers guests a smorgasbord of dining choices. This is not my first trip here so I ‘ll share my favourites. For super sushi, head to Chinos in the Marina. 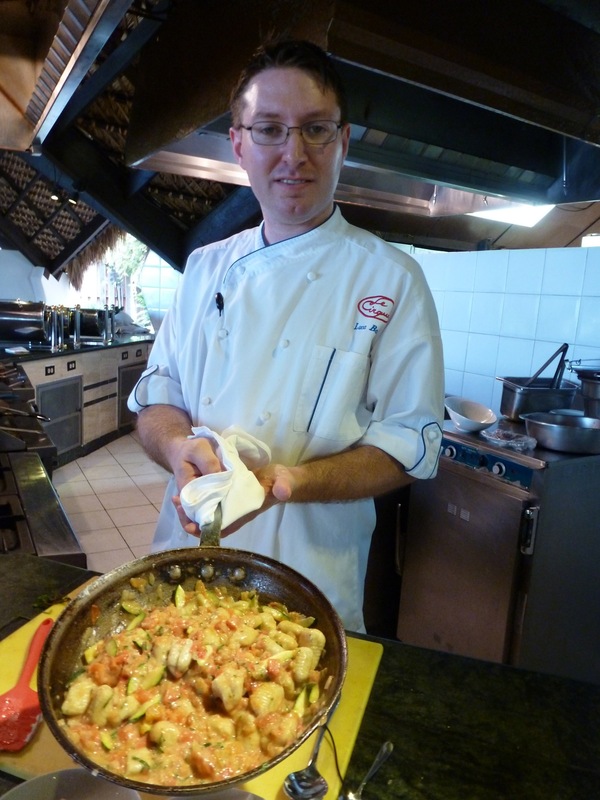 Or, try the snapper cooked in a sea salt crust and then flambéed at the Marina’s La Casita restaurant. My favourite is The Beach Club by Le Cirque. Request a table on the patio and dine via candlelit under a sea grape tree while the waves provide gentle background music.